Have you ever considered consuming your placenta? Placenta encapsulation? Eating the placenta?!!! I vividly remember years ago, before I ever had kids, sitting at a bar-b-que and hearing my father in law talk about how every woman should eat her placenta. I was totally disgusted. He said something about how animals did it. I think my father was there and he said something along the lines of, "Yeah, so that other animals don't find THEM and eat them because of the bloody placenta they are trailing around." My father in law talked about how disappointed he was that his wife always refused to eat the placenta, despite his urgent advice to do so. Fast forward a few years and I am giving birth to my second child. The midwife at the birth center had me sign a paper on one of the visits so that she could dispose of the placenta. "Do people actually WANT that?" I ask, incredulous. "Yes- I have even had people eat it RAW!" she admits, since it is obvious that I am not a believer in this particularly twisted form of self cannibalism. True confession. I just had my fourth and I am almost finished with....THE PLACENTA. Yes- I have been eating it. I am not so bold as to consume it raw, I still have some gag reflex left. Let me tell you how this happened. I must admit that this fourth pregnancy was a, shall we say, surprise. (Hubby says no child should ever be called an accident, so we will stick with surprise.) So when baby number three was just 13 months old I found myself to "surprise" be pregnant. True story- I cried for a week. It wasn't that I didn't want any more children, I was open to that. It was just that the timing freaked me out a bit. I didn't feel mentally, much less physically, ready for another pregnancy or birth. This would be my fourth baby in six years. I have been continuously nursing or pregnant for the last six and a half years. Frankly, I just felt literally drained. Like my body had been giving and giving and giving and just needed a little break before it could give any more to another human being. But- a break was not in the cards and I was pregnant again before the memory of the last birth had even faded to the background haze of "that wasn't so bad..."
By now I am well indoctrinated into the world of natural birth. At first, things like eating your placenta seem pretty wacky. Then you hear of lotus birth, free birth, nursing toddlers, rear facing car seats until the age of two- you know- the list of crazy "natural" stuff just keeps getting longer. And yet, the idea of consuming ones own ORGAN (for goodness sake) still sounds a little freaking weird. But- boy do I feel tired! Like really, my body is worn out. Plus, as if things can't get harder- I turn 31!!! Ouch. I am now in my (gasp!) 30's. I have heard women talk about the benefits of placentas. It makes post-partum depression disappear. It helps with milk supply. It helps with weight loss (I admit, this is the first thing that gets me thinking.) I can't really find any real proof that it does these things, but hey, there apparently isn't any proof that natural birth is great so, who needs proof? I throw the idea out to my husband. "Maybe I should eat my placenta this time..." His initial response. "I am so posting that on Facebook if you do that!" is followed by, "I will just buy you some supplements if you feel like you need something to help you recover." But I take a look a the supplements and I realize that these expensive and high quality whole food supplements are made of....animal organs. Yes - it is true, many fantastic supplements are simply ground up cow livers or kidneys or the like. I start to think, why not just eat my own? At least then I will know what is in it. Now- it is the time of birth. I accidentally have an unassisted birth (I know, next thing I will be leaving my kids rear facing till they are two) and the midwife promptly asks me (when she arrives) if she should get the placenta going on the dehydrator. Yes- is my response. It dehydrates for 24 hours (and no it did not smell strange) and yields some stuff that I will admit, looks oddly like beef jerky. I took it out and ground it up in my little spice grinder and put it in a bottle. Honestly, I was planning on encapsulating it (putting it into pill form) but one day post-partum, that just wasn't happening. And- I will admit, though it sounds very very odd, I really felt like I should eat some. Like, it sounded GOOD. So, I took a spoonful of the powder and stirred it in orange juice, closed my eyes and threw it back. I have done the same thing every day since, with only a few exceptions. So- was it worth it? I can't prove that it did anything. But I must say that though I have never seriously struggled with overwhelming post-partum depression, I always have a complete nervous breakdown on the third day after giving birth. This is the day that my milk comes in, my hormones re-boot and my entire world basically comes crashing down. I cry. A lot. I get overwhelmed. I feel like crap. I cry some more. My husband looks at me like I am insane. I am, in fact feeling a little insane. This time- nothing. Not only do I not crash the third day, but I feel FANTASTIC. In fact, normally I pound B-vitamins every day to keep myself a little more emotionally stable, and though I didn't take them at all post-partum (just my placenta) I feel so incredibly happy. I must say that this is the best emotionally that I have ever felt after giving birth. I also feel physically good. I no longer feel drained and tired. I feel like a person again. So- to sum up, I do feel like consuming my own organ, the placenta, helped my recovery immensely. I know too, that my passed father in law is looking down on me from heaven and he is just so proud of me for eating it. And now, rather than thinking that he was nuts to encourage this, I am simply amazed that he was so ahead of his time, encouraging placenta consumption 40 years ago. And yes, my brother called me a cannibal. I am cool with that. When I first came across the concept of placenta ingestion I was put off too but the more I looked into it, the better it sounded. My aunt then sent me a recipe for placenta lasagna. I think I may have thrown up in my mouth a little. I opted to encapsulate it and that worked for me! I found that I had great energy and I think it helped me recover from a difficult birth both physically, and emotionally. I highly recommend it to everyone, even if they throw up in their mouth a little at first. 3. I will take said pill, but I'd prefer I didn't know it was placenta. I've read a lot about it and my Bradley instructor prepares women's placentas for them after their delivery. Even though I have become quite "crunchy" during these past 9 months of my pregnancy...I just can't wrap my head around this one. after dealing with PPD and I am KICKING myself for not ingesting my placenta! I too suffered from the 3rd day meltdown. haha I had no idea until a few months PP that it could be encapsulated. I will be doing so with subsequent pregnancies! Thank you, thank you, thank you for sharing that! I have been tossing the idea around, and I am definitely going to do it with this baby. I don't know how, but going to get it done! I felt like I was hit by a train after each baby...Especially after my winter baby in 07. I'm having another winter baby and really scared I'll lose my mind. :0. So commenting with a thanks and off to do more research. Im pregnant with my 5th in 9 years and considering it for the first time also. For me it would be about feeling good and avoiding the anxiety/PPD that I get after birth. Thanks for sharing, I think its awesome! You know, with most things birth, something may initially sound crazy to you... but if even that spark of interest is there-- some admiration, curiosity, what have you-- you are likely to come around at some point. This can apply to home/water/unassisted birth, placenta consumption, and more. If part of you realizes that it's probably worth the benefits, you will come around to learning more and probably trying something out. Then you get to see how great it is firsthand and it's not so crazy anymore. Oh, the benefits of learning! :) Good post, Mama Birth. Thank you for sharing! I love hearing stories about how it has helped ladies. I was just having a conversation with some friends about this last night. Here in NZ a lot of people keep their placentas and bury them, as it's about returning such a special organ, which kept our babies alive, back to mother earth. So we're already less squeamish about placenta things as it's viewed as a beautiful thing, and we see it and handle it ourselves. Maybe that's why consuming one, given the benefits, doesn't seem as gross to me :-) Having it in a capsule or powder sounds like a good idea- much easier than cooking and eating it like a bit of meat. Thanks for sharing! 20+ years ago when I had my first, I knew some hospitals would actually cook your placenta (liver & onion style) and serve it to you for dinner. I didn't begrudge anyone that wanted that, but just didn't get it. 2 more pregnancies and I was considering a lotus birth (though I didn't do that). I'm pregnant one last time and think I'm going to do a lotus birth, at least for a while. And thank you... I will look into this placenta business further and see who I can get to handle it for me. I'm nearing 40 and I am sure I could use all the help I can get! When I first read about it, it was hard to get my head around even though it made sense. I just had my fifth in nine years and she was a "surprise". I encapsulated my placenta this time. I have taken the pills here and there. Did/does it help? I think it must, it can't hurt anyways. My sister in laws were here when I did it. I steamed the placenta first and they laughed about how it looked like any other roast. I also froze a few small chunks for smoothies the first couple of weeks and put another chunk in vodka to make a tincture. My husband wanted nothing to do with the process and didn't really want to know what was in the jar in the cupboard. Most people find it gross so not something I tell people, but many also can't understand why we would take the risk of homebirthing like we did and "thank god we were at least using a midwife". My anecdotal evidence says it works like CRAZY. Just had my third baby and this is the first time I did the placenta encapsulation and I positively could NOT BELIEVE the difference. Now, the amazing homebirth might have also done something to help, but I'm telling you, the days that I didn't take my little happy pill, I totally saw a difference. I'm a die hard believer in eating one's placenta now. I'm actually proud of your FIL for being smart enough to know that women can and should eat it! Hi Mama Birth, Nice blog you got here! try visit my new post: Blog SEO Tutorial: How to Choose the Best Title For Post. I hope you will learn something from it. Have a great day! It's easy to find vegan vitamins, minerals, and supplements! You don't have to eat ground-up animal anything! I eat my placentas...RAW. CRAZY! Maybe, but with the help of my blender it really isn't bad.In fact, it tastes great. Well, the fruit it in masks any placenta flavor. As my midwife calls them, "placenta smoothies". It all started after the birth of my second child, my first homebirth, when my midwife brought me a smoothie. My first thought was, "wow,homebirth midwives are awesome!" Her and my husband asked if it tasted alright. I said it did but could tell my husband knew something I didn't. He told me what was in it. She told me how great it was to replenish blood loss, balance hormones, aid in pp recovery, etc. I have later read that out is full of good immunities. I can testify that it works amazing in aiding pp recovery. With my first child, I wasn't back to myself until 9 months pp. After my second I was more energetic by 2 weeks pp than I was with my first and better than normal by 5 months pp. With my third it only got better, venturing out to libraries 2 weekd pp. I lost weight faster, and feel normal again by 3 months pp. I am sooooo thankful to midwife for helping me(and two of my friends who use the same midwife, who can also attest to the miracles of placenta eating). How do we do it? 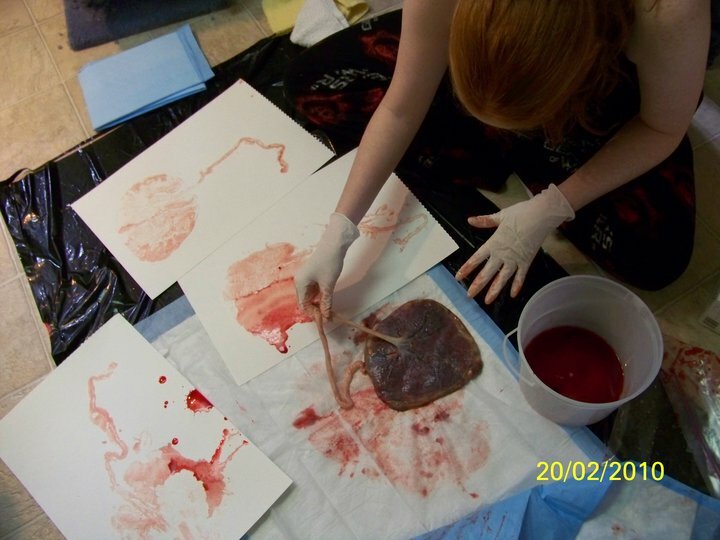 The midwife and her assistant cut up the mother's side of the placenta into about 1 inch cubes, places them in snacksize bags, puts them all in a freezer bag and puts the bag in tge freezer. The first smoothie doesn't use frozen placenta,but the rest do. What to put in the smoothie? Not that I have ever made one, and I don't think I could. Thankfully my husband makes them all for me or I might gag. Not that I have ever gagged drinking one! Anyhow, use more bitter fruits, so as to mask the bitterness of the placenta. Berries work well. I buy frozen berry blends such as: blackberry, strawberry, raspberry and strawberry, pineapple, mango. Mix a berry blend or even just strawberries with one or two placenta cubes, orange juice, yogurt, maybe ice(I never made myself one, the midwife showed my husband how to do it, so ice or no ice, it probably makes little difference and yogurt or no yogurt makes little difference, they are both great) and voila! I enjoyed these secret shakes every day for about two weeks pp. I do hope this inspires many motgers out there. Thank you for sharing and happy smoothies to those who dare to be primitively natural! First of all...how does one prepare the placenta? (to be eaten raw). Removal of cord and membrane? And i saw a previous poster said something about the 'Mother's side" of the placenta. Will this be obvious, which side is which? I plan on cutting into cubes and freezing. Also, would it be a problem for an rh- mama to consume the placenta of her rh+ baby? Just curious! I can't believe I even read this post all the way through! Yuk! I guess chilbirth changed me! Hahahaha! @Corrabelle, what an excellent question about RH incompatibility and placenta consumption. I have no answer for you, but I am going to research it or sure. I can't imagine that it would be unsafe as ingesting is not the same as blood mixing. If it were unsafe I would imagine it would also be unsafe for an RH - person to eat any meat, especially organ meat. I was planning on encapsulating my placenta with my second. My best friend was all set to do it for me and I filled out the paperwork to be able to take it home. BUT, the birth center (hospital affiliated) has a policy that they keep it there (refrigerated) for 7 days before they'll release it to you. When I finally went back to pick it up I just sort of thought, "How do I really *know* this is mine??? Hospitals make mistakes all the time. Am I really willing to risk the (admittedly miniscule) chance that I could get HIV or something from eating someone else's placenta?" So I put it in the ground and planted a tree for my baby that the deer ended up eating anyway. BUT, now I'm pregnant with #3 and I really want my placenta. I think I even want it before 7 days. I could totally imagine having some fried up with my first post partum meal. (Sorry if that made anyone yak.) I just had a lot of weird hormonal things last time that lasted a LONG time - for example bleeding for 4 months post partum until my midwife made me start taking progesterone-only birth control pills in an attempt to stop it. So ... who has advice for me? Can I flat out refuse to go along with hospital's policy and keep my placenta from day 1? What should I do? We plan on doing the smoothies this time around. I will not tell anyone though because it does seem so strange.